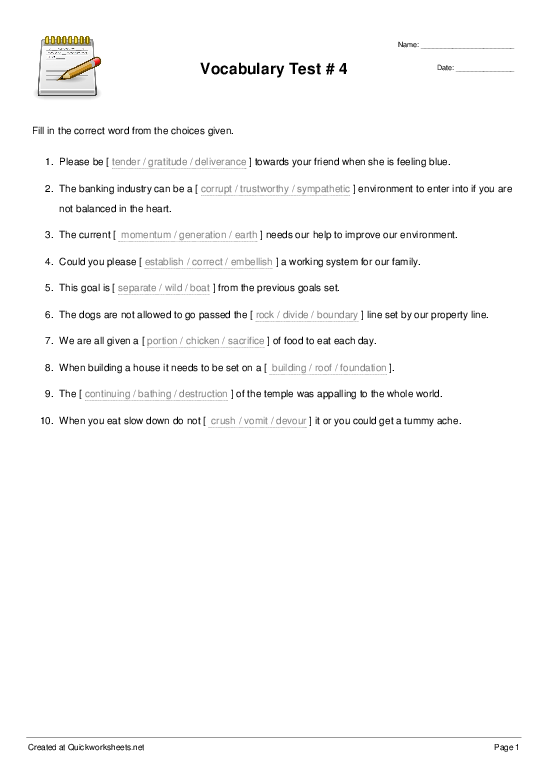 This worksheet generator creates one blank per sentence with multiple-choice answers for each blank. For passages of text, or for more than 1 blank per sentence, use the Fill-in-the-Blanks Passage (Cloze Test) Worksheet Maker instead. Fill in the correct word from the choices given. Inline multiple choice (write answer). Inline multiple choice (circle answer). Word Bank at top of page. Enter a sentence without blanks. Click outside the field when done. A yellow "blanking box" will appear. Click on a word in the blanking box to replace it with a blank. Enter wrong alternative choices for this blank (inline multiple choice only). For more than 1 blank per sentence use the Cloze Test Maker instead. Click a word above to blank it.